Really?, my rumble already works with this controller ingame... and btw next month i get my pay check. i will defenetly support you with some money! love it! Keep up the good work! (03-17-2014, 04:41 PM)Rizzler Wrote: Really?, my rumble already works with this controller ingame... and btw next month i get my pay check. i will defenetly support you with some money! love it! Keep up the good work! 1. You enable it via settings. It is never enabled by default. 2. You get a couple settings for triggering the trigger pull + lock: one is that you must hit a certain point on the throttle, say position 255, before trigger lock is engaged. Another setting configures a period and lets you require an optional double-tap to lock (and single-tap would still unlock). 3. Yet another setting would let you adjust the rumble feedback strength. There are two motors and each one can be used to inform you that Rumble Lock is active. The rumble feedback, then, is similar to the rumble feedback that you get from the touchpad Button mouse mode while the touchpad is held. It indicates the current state, that a certain keybinding is being activated. I might try making a new B&W icon with something the symbolizes the DS4, like the shape of the light bar or something. That might work for too for colors. I'll run a few test ideas and see what I come up with, anyway you guys are free to try the icon as always, I couldn't get Donbabbeo's program to show up in the notification area. The Face Buttons.zip contains the images directly above. Mmm i'm investigating right now why the icons didn't work and will try your new icons. In the meantime, as promised, i uploaded all the code. Keep in mind that ATM the code is pretty confusing, need a lot of cleanup and a lot of comments should be added or translated. PPS: i kept the license of DS4Tool and DS4Windows, if someone with some expertise in the matter want to chime in, i'm willing to change it. EDIT: did you enabled the trayicons? it should be disabled by default... 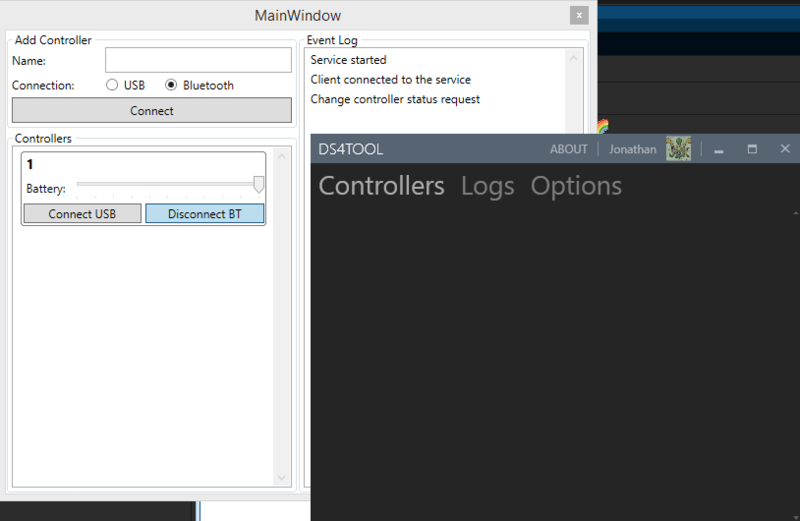 When you "connect" a new controller click on it on DS4Tool, it will open a menu with a checkbox. Click on it to show the icons, mine is working. About your icons: i love both, but if we will show also the led color, the face buttons become too messy. BTW i love the new pad icons, but imho are too much detailed, keep it a lot simpler, stilized, like the standard connection icons or volume one. (if you need them as a reference i will add them in a few mins, gimme some minutes). Remember also that we are not limited to static icons. We could have the icon alternate between different visualizations to make it easier. One of them could even just be a number from 1-9 and a plug for charging instead of 10. The catch is, I'm not 100% sure what all of the possible battery readouts for the DS4 are. I only have one controller to test with. I think the icons with the 4 buttons are pretty, as is the ds4 icon, but changing the color intensity will not be helpful for the user to know the percentage of battery. I think something like the ds4 icon has (filling the icon from left to right or bottom to top) or maybe something like green for full, orange for half, red for empty is easier for the user to know the percentage by just looking at the icon. Other possibility is putting the percentage inside the icon like fraps. And also what about showing only one button instead of the four to solve the size problem? (03-17-2014, 10:37 PM)Donbabbeo Wrote: EDIT: did you enabled the trayicons? it should be disabled by default... When you "connect" a new controller click on it on DS4Tool, it will open a menu with a checkbox. Click on it to show the icons, mine is working. As for the second part, yeah I was trying too hard for detail on the icon, I'm working on a simpler one now, and edit this post later. (03-17-2014, 11:19 PM)Banyuyaga Wrote: I think the icons with the 4 buttons are pretty, as is the ds4 icon, but changing the color intensity will not be helpful for the user to know the percentage of battery. Actually I was kinda thinking about this earlier and because the four face buttons have colors, we could use Green Triangle for full, then Blue Cross, then Purple Square and Red Circle for near-empty. As far as color highlighting to indicate battery level, that isn't quite what I was getting at, more like the color indicating which controller is being displayed when you have a couple icons; the controller icon itself would then be filled in or blank as you have conceived it now. The controller icon fill I think would look nice at a diagonal, like many gauges, or possibly as a sweeping arc like a traditional fuel gauge in a car. I definitely really love the idea of making an icon set that puts the actual numerals in there. That would, for me personally, be the easiest to discern at a glance. But I am not a typical user, really; I am a programmer by trade. When you add a controller, don't forget to insert a name. ATM it's a mandatory field because it's used as an ID field. (03-18-2014, 12:08 AM)electrobrains Wrote: Actually I was kinda thinking about this earlier and because the four face buttons have colors, we could use Green Triangle for full, then Blue Cross, then Purple Square and Red Circle for near-empty. As far as color highlighting to indicate battery level, that isn't quite what I was getting at, more like the color indicating which controller is being displayed when you have a couple icons; the controller icon itself would then be filled in or blank as you have conceived it now. I see, and like where you're getting at, however at the size of the icons, it's difficult to have the numbers inside of it, plus there's much less room to work with any shape use that's not a box. I'm doing it the Windows Style in hopes people could make the connection, but even then I'm not sure, even so below I posted the new set of DS4 icons I made. (03-18-2014, 12:11 AM)Donbabbeo Wrote: Maybe i found the mistake.